Arecent talk by writer and activist Julian Brave Noisecat on displaced indigenous peoples in California was midway interrupted by a CUNY security guard. The guard politely acknowledged the disruption, and asked for a break in the proceedings while arrangements could be made to accommodate the steady stream of audience members who continued to pour in well after the event had started. Sean Kennedy, the organizer and facilitator of the CUNY Adjunct Project event, negotiated with Graduate Center facility staff in the hall about opening the room up to accommodate the swelling crowd. Security instructed audience members to step into the corridor while the staff rearranged the room to accommodate the larger audience. The irony of the request to move was not lost on the group of activists, lawyers and academics. Someone from the audience made a joke about the audience being displaced. Marina Ortiz, an East Harlem organizer who had already finished her segment of the talk a little earlier, took over the mic as maintenance staff folded the collapsible walls, insisting on continuing the event that was being live streamed. In spite of the shuffling of patrons and chairs, Ortiz continued on message to speak about gentrification and housing displacement issues. During her talk, Ortiz relayed some of the efforts that were being made by activists and community members to resist and protest rezoning efforts in East Harlem. She encouraged any audience members interested in organizing at any capacity to talk to her after the event or reach out on virtualboricua.org. Panelists’ presentations focused on the intersection of labor, gentrification, urban development, politics, unions, and the housing crisis in New York. In her talk, Ortiz invoked the working-class lineage of East Harlem, and discussed how over the past century the immigrant communities responsible for building all the infrastructure in the city were being pushed out and displaced by developers. East Harlem is among fourteen communities of color currently undergoing rezoning, as opposed to wealthier neighborhoods like Riverdale which are protected and preserved. As such, gentrification processes are penetrating and creating mass displacement of communities of color, largely facilitated by real estate power. “We’ve had warfare states. We’ve had a welfare states. We are living in a Real Estate state. Where the government is geared towards the needs of real estate,” said Sam Stein, a CUNY Grad Center Urban Studies scholar. Stein had kicked off the evening by emphasizing the real estate industry’s power to shape urban development, and politicians’ eagerness to allow the unchecked appropriation of neighborhoods that had been homes to working-class New Yorkers and immigrants. Stein, who was researcher at two of the major buildings trade unions, including SCIU 32BJ, is well-versed in current New York labor trends, specifically as they pertain to housing. 32 BJ is the union for the entire east coast property management staff, including doormen, janitorial staff, and security. Stein underlined the ways in which all these professions are directly affected by the housing crisis and have been active in the rezoning hearings around the city. Panelist Chaumtoli Huq, a Bangladeshi-American labor and human rights attorney, turned the audience’s attention to the criminalization of urban space. Huq herself had been unlawfully arrested during a peaceful rally in Times Square. As founder and editor-in-chief of Law at the Margins, she has written extensively on human rights issues. Huq discussed her organizing and participation in movements with immigrant communities over housing and labor issues in New York. The final speaker, Susanna Blankley, offered a more historical perspective on housing and urban development in New York. She emphasized that since the arrival of the Dutch in New York, the economy has been rooted in land speculation. As a coalition coordinator of Right to Counsel NYC, she has had extensive experience organizing and her discussion focused on successful precedents for organizing in New York City, including pre-war era Lower East Side immigrant neighborhood-wide rent strike that lasted for years. 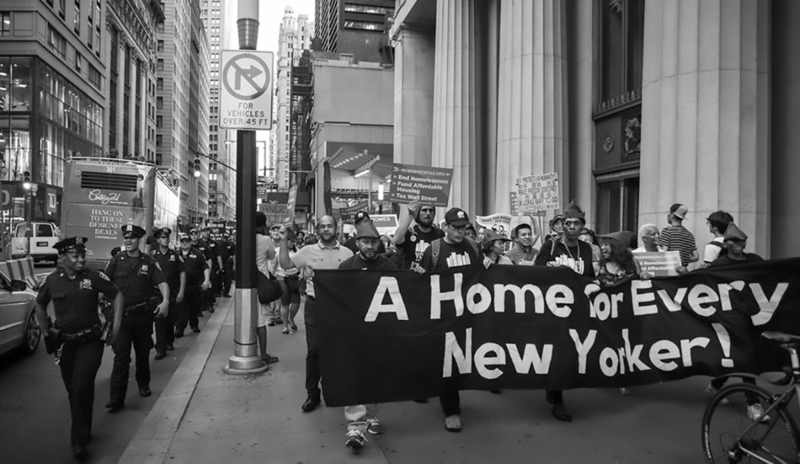 The success of these rent strikes is a model for mass protest against the increasing commodification of space and the gross displacement of working class and immigrant communities. New York is currently in the midst of multiple rezoning projects which will impact hundreds of thousands of residents in Washington Heights, the South Bronx and Harlem. Event attendees and local activists on the panel echoed the growing concern over the rezoning of East Harlem and the Bronx, many who are personally affected as residents. Attendees of the event included graduate students, activists, organizers, interested community members and faculty. “The goal is for the people to become owners. To cut out most of the middle men. Brokers, developers, all of them are taking their cuts.” said Fillip Popovich, an architect originally from Serbia who attended the talk. Popovich cites collective housing movements like the Berlin based Baugruppen for inspiring his interest in architectural activism. He found out about the Struggle for Housing event through social media and saw the event as an opportunity to gain insight into community based housing solutions. Around 8p.m approached, facilitator Kennedy informed the audience that we still had the room for another hour. With the room expansion disruption and the audience introductions, the event had exceeded it’s scheduled time. Regardless, attendees were still engaged and eager to participate in the Q&A. Participants offered insightful questions and comments, focusing on a range of issues from union organizing to the issue of CUNY student displacement. It was the beginning of a network that would use the insights it had gained to question and organize across communities, attempting to break down the silos between not only communities but the realm of work and home. The event had generated strategies, critical questions and debates that continued through to the reception downstairs, where some of the panelists and attendees remained over the next two hours continuing to discuss issues of rising rents in New York and the toll it has taken on families and those seeking to start families in an increasingly prohibitive city.